We call it Peyote, but more often, because of what it does for us, we call it our Medicine. My people have an old story about this herb. They talk about its power. They say that this particular herb is the most powerful of all the plants because God endowed it with his love and compassion. He put those qualities into this lowly herb so that when we eat it we can feel that the love that God is -- I emphasize the love that God is, not that God has -- is physically inside us. From there it overflows in compassion for human beings and all other kinds of creatures. It enables us to treat one another tenderly, and with joy, love, and respect. The Native American Church is the spiritual bulwark of a quarter million of the original inhabitants of this continent. Its roots extend into the twilight zone of prehistory, before the rise of Christianity. But because its sacrament is Peyote . . . members of the Native American Church could not practice their religion without fearing a knock on the door. 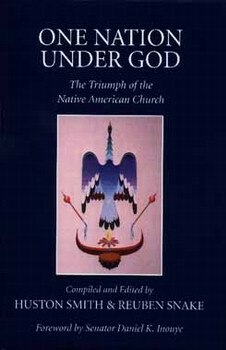 In the early 1990's that fear escalated, due to the Supreme Court's explicit ruling (on April 17, 1990, in Employment Division of Oregon v. Smith) that the Bill of Rights -- specifically the 'free exercise of religion' clause in the First Amendment to the united States Constitution does not extend to the Native American Church because of its sacramental use of peyote. This book is the story of the Native Americans' response to -- and victory over -- that ruling. The judicial branch of the United States having deserted them, they resorted to its legislative branch. Without a nickel in their coffers, they challenged the highest court of the land on the peyote issue and won, reversing (by four years of determined effort) four centuries of prejudice against their sacrament. It is a story that deserves to be documented, remembered, and retold for generations, for it carries hope for freedom lovers the world over. The prime mover in securing the passage by Congress of the American Indian Religious Freedom Act Amendments of 1994 . . . was Reuben Snake, this book's co-editor.